The Dow closed February of 2009 at 7062. That's just a smidge over 7000 but now over 400 points below the double-top mid-point of 7500. Uh-oh! The bulls are running out of pasture. The Dow is now down some 20% for the year already! Ouch! Not our portfolios, though. We have already turned positive in one and we are very close to doing so in others. Why? Well, we are not Madoff or Stanford so I will be happy to explain. My opinion of the market has not changed since two or three years ago. We are in the 'Mother of Bear Markets' and the bear will not cease just because all the folks on the cartoon network want to proclaim 'a bottom'. The bottom is where the bottom always resides. All the stupid people have to lose all their stupid money. There. Now you know what the real bottom looks like. This is a brutal market. Our best weapon has to be the brutal truth. If you can't handle it, don't play. Stay in a CD. You will soon understand the effects of inflation and eventually, our new government may decide that your CD is their CD. Welcome to the new era! That goes without saying. This is not a market for the average American who has de-evolutionized into a profoundly ignorant dope seduced by illusionary riches that can be driven, lived in, margined, mortgaged multiple times, bought with plastic, and finally repossessed. The majority of American citizens elected a new man to serve with the title of President based on a misguided idea that 'change' was good. Change can be either good or bad. What a profoundly ignorant public does not understand is 'change' and 'progress' can be two entirely different things. For instance, I can lament my current situation if I have been recently laid off. To garner an income, I can turn to crime and become a robber. First, that would be morally wrong and second, it will only lead to incarceration and destruction. But, it would be 'change'. Or, I could dust myself off, perhaps retrain myself, and seek other gainful employment. That would be progress and change. Unfortunately, America has been dumbed down to something below the lowest common denominator because I'm sure most people can't count past ten (using their fingers), much less even fathom a fraction. Just look at the people that we elect to represent us in government. Could there possibly be a stupider bunch of people on the planet? The past two years in the stock market have been historic in that the 'market' has been hi-jacked. It has been captured. In my book, Navigating the Mind Fields of Investing Money, I wrote in 2006 that 'investing was dead and the market was no more'. The governments have taken them over in an attempt to cover up their cataclysmic bungling of economies of the world. Globalization has been a difficult adjustment for economic experts much less, the governments that participate. So in 2006, Hank Paulson and the Plunge Protection Team completely took over the US stock markets with manipulative efforts to keep it growing to the sky. That can happen if you have a good root system but our root system was rotten. It was fertilized by the miracles of margin known as derivatives. The derivatives world allowed a Ponzi scheme to develop in which lenders could invent and create 'capital' from which they could lend and invent more 'capital'. In truth, the newly invented 'capital' was nothing more than sheets of paper with very big numbers written on them. The Ponzi scheme that we call our economy has begun to dissolve now that the holders of said 'capital' have realized the scam for what it is. Yes, the subprime real estate paper has been an instigator of economic desolution but everyone was a player at some point. For years, our government has been nothing more than a pathological lying economic happy news propaganda machine devoted to nothing but cheering the stock market higher. They feed it everything it needed. They changed accounting to move decimal points in any direction necessary for positive results. They changed equations that measured things like inflation to make it look there was none when there was. They promoted the Commerce Department that has become nothing more than a laughable bunch of pretty number reporters devoid of reality. Yet, our government has been clever. They knew all along that if they could keep the stock market going up, the dumb people of the land would never question a decimal nor a derivative. And the beauty is that every dope on the planet could be a stock market investor with instantaneous skills of a pro. None of us had to know anything. We could just open an account and the market would reward us. Only, our government leaders have been manipulating the markets higher with freshly printed money, exponential margin created from derivatives, and soothing news of the government acting as a trampoline to catch and rebound any falling portfolio. The Dow peaked at over 14000 in October of 2007 and investors have been tricked by past governmental intervention efforts into believing that every dip was 'a bottom'. Where was Bernanke? Where was Paulson? Where was Bush? Where was the Commerce Department? Where was the cartoon network where every dope investor gets their 'expertise'? All of the con men in the world tried to keep the market up but at the end of the day, the stock market needs true fundamentals. We don't have them and the market remains very over-valued at the present. Even after falling 50% from the highs, I think the Dow could easily fall another 50% this year and still be over-valued. No one can save us now. Paulson is gone. Bernanke has shot all rounds in his holster by lowering the Fed Funds rate to zero. And now we have a new President. Socialization and federalization are for the weak-minded and anti-capitalists. Obama favors this kind of government because these are his people. However, knowing that the market was missing the fundamentals to progress, I have been in the camp of the short sellers. Last year was a difficult year. Both long and short oil was down. Long and short real estate was down. Long financials were way down and short financials were about flat. Nothing worked due to all the massive government intervention. I knew that Mr. Obama would make things easier for the short-sellers. My faith has been in, 'Obama - But for a completely different reason'. Everyone else can extoll 'change' or whatever. I'm a capitalist and I look for opportunity. The idiocy of our new government will run the nation into the ground and take the stock market with it. So be it. It is time to short. Only a few will be rewarded. The rest will perish. Choose your side wisely. 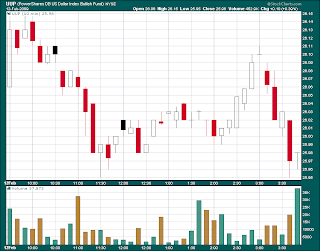 Let's take a look at a one-week chart of the Dow. You can see the hard selling on Monday and the quick recovery on Tuesday. Fed Chairman Bernanke told the stupid people that the Fed was not going to 'nationalize' Citigroup or any other bank. So, the market rallied. Of course, the same guy told the same stupid Congressional committee that the Fed would have to take a 'substantially larger ownership' in some banks. He knows that he is dealing with the idiots in Congress so he can tell them anything as long as he puts a stick of cotton candy in their sticky little hands and they will sit and be happy as they are dumb. No one raised a question. Rally time! But then, reality is a beast and the market resumed its downward spiral. 7000 is the next stop. I wouldn't be surprised if we don't dip to the mid-6000 range and then experience a decent bear market rally. As we go into next week, we must digest the newest GDP fourth quarter number of minus 6%. As an investor, you must remember that stupid can work for you. The idiots that run government will make the stock market into one of their casualties of the war they are promoting against all of us. Another week, another pummelling. The S&P dropped nearly 7% for the week with heavy volume on Friday. 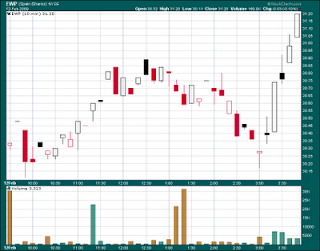 It was 'options expirations Friday' so the heavy volume was expected. Also, the Dow was plunging over 200 down when out of the blue right after lunch, it came back to even. It then lost 100 to finish the day. Other than options Friday, to what could we contribute the down week and volatility? Obama signed into to law another 'stimulus package' that digs our debt grave deeper. But we all knew this stupidity would resume. Clearly, the market gave the stimulus a thumbs down. More importantly, the market pitched and swayed all week with the talk of bank nationalization. Clearly, we have become a nation of whiners and quitters and have willingly surrendered our capitalism and Constitution to the banker rulers that promote the bailouts. There is very little fight in America partly because American citizens are profoundly ignorant of all things economic. Our Congress and House remains dumb and dumbfounded and with each jag down on the Dow, willingly sign away our country and its future. This is why I write. Wake up, America! Germany passed legislation allowing them to nationalize their banks. It's all over the world. The banking system is collapsing. Or is it? The CEO of our largest bank, Bank of America, says that his bank is just fine. It does not need a bailout. Well, other than the one he was begging for last week to facilitate the digestion of Merrill Lynch. But let's just assume that Mr. Lewis is telling the truth. BofA is sound and healthy. Then why all the 'nationalization' talk? Why does the government keep the subject alive? Why don't they back off, shut up, and leave the bank alone? Maybe this is part of the master plan. Maybe the government wants to own all the banks. Maybe governments all over the world swoop in, take the banks, and then unify under a central bank. It is a disgusting thought but something is not right here. All this leaves the stock market in a flighty mood. The Dow has lost the critical 8200 - 7500 range as we end the week at 7365. I would expect the downtrend to continue next week. Economic conditions continue to decline. Washington continues to display a complete ignorance of the country that they represent. I watched Barney Frank conduct the inquiry of the bank CEOs and I actually wanted to vomit. He was twirling his gavel around holding the mallet end and pointing the handle at his co-horts. He was content and smug. And why shouldn't he be? He gets a salary for life - on us. He gets the best health care on the planet - on us. He has job security - on us. He makes big bucks - on us. He is like all of our representatives that we waste good time casting votes for in November. Non of them understand or care that America is hurting. Let me leave you with this idea. If you had money to lend, wouldn't you raise your interest rates as your supply of capital shrank? That's called 'supply and demand'. As your rates would rise, demand would diminish. That process keeps everything in balance. Doesn't the government claim that 'lending has seized up'? Then, shouldn't interest rates be much higher? If this makes sense, then why has our Federal Reserve done exactly the opposite? They have lowered rates to zero. Doesn't this promote speculation and reward foolish lending? How did we get in the current predicament? Yep, speculation and foolish lending. Capitalism is a beautiful thing but you have to let it work. Our current government has no intention of doing so. I suspect they will nationalize our banks in the coming weeks and I suspect the Dow will gash the 6000 mark before the 'stimulus' package gets unwrapped. The Democrats in the House and Senate were determined to pass a 'stimulus package' and so they did. Republicans gave the package the thumbs down but it didn't matter. Leaders Pelosi and Reid seem to think they have a better idea as to how to run the biggest economy on the planet so they loaded up the monetary printing press ink jets and pressed 'Print'. For his part, acting President Obama engaged himself on a 'begging for bailout' tour of America and warned of an impending economic 'catastrophe' if the printing presses were idled. Meanwhile, jobs were still dissolving, unemployment was rising, and economic conditions around the world continued to accelerate their downward spiral. So, instead of working for real solutions to our economic demise, our Democratic leadership huddled around the printing press like the apes in '2001 A Space Odyssey' huddled around stone slabs protruding from the ground. Sadly, they are actually dumb enough to think they have the answer. In truth, the real answer is the economic equivalent of kudzu. It is called 'capitalism' and left alone, it grows like crazy. It will choke out everything in its path. Will there be pain? Of course. Bad companies, bad investors, and bad citizens must be drowned by capitalistic forces that present emergent opportunities to those of skill and prudence. Capitalism has always worked. Printing presses have never worked. Yet, we continue to let our idiot politicians engage in crazy behavior as defined by doing the same thing over and over and expecting a different result. Unfortunately, our elected officials are far too stupid to battle the real power that has invaded our country. The central bank controls the world of derivatives and they have ballooned that beast to close to a quadrillion dollars. For perspective, the stock market capitalization of the world is less than $60 trillion dollars. To carry on their shadow banking Ponzi scheme to rule the world, they need some very large banks to help out every now and then. You know, when they need someone to buy up garbage like CountryTime Credit or Bear Stearns or AIG, the small banks don't have the fire power. No, this is a 3-card monty game and shills are needed to pull of the scam. Since the big boys apparently loaned out and then lost all of their money, the central bank has to restore them. Thus, we have TARP and TAF and HEIST and THIEVERY as they come up with ways to shift money away from the taxpayers use to the banks' use. Treasury Secretary Geithner wants another $2 trillion and the dopes in Congress want another $1 trillion dollar installment in the 'stimulus effort'. Yeah, that'll work. What did the stock market think? Well, the Dow went down about 5% on the week in spite of a gallant Plunge Protection Team (PPT) 238 point one hour rally at the end of the day on Thursday (2/12/09). Why did they rally the Dow at exactly 3:00 pm? Well, the Dow fell to the 7600 level and that is the mid-point of a double top from depression city and they just don't want to let natural forces play out. Interestingly, at the same hour on Thursday, the dollar crumbled and bonds sold off. This means we, you and me, have become sacrificial lambs to the bankers. In an effort to save them, the PPT is willing to devalue the US dollar and let bonds sell off resulting in yields and interest rates moving higher. Here is an easy question: Do we need interest rates to go up right now? Of course not. What was it that Isaac Newton proposed? Every action has an equal and opposite reaction. You simply can't manipulate the stock market and not expect to suffer from some nasty consequences. The bottom line is this. The stimulus is about helping the banks to help themselves to us. It is not about helping the average American. And, the stock market is beginning to realize that. Thus, the sell-off this week. Looking ahead, the 7500 range to the 8200 range is Hamburger Hill to Bernanke and the PPT. This is WWIII. The central bankers of the world will throw everything they have at the stock market right now. Unfortunately, the stock market isn't the one that's broke here. It is 'Joe' America and he is spent out, borrowed out, mortgaged out, leveraged out, and quickly becoming down and out. Our economy has run out of prospects to spend Obama's 'stimulus' and borrow Geithner's bailout. Look for more of the same next week with downward market bias. The Plunge Protection Team is at it again! Ta-da! 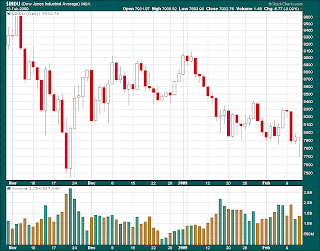 February 12, 2009 - The Dow was in serious trouble as it plunged 238 points to the mid-point of the 20-year double top. This is the dreaded 7500 mark and technicians know that if we breach it, the Dow inevitably goes below 1000. Not to worry. The Plunge Protection Team saved us on November 21, 2008 when we pushed the 7500 mark with a miraculous last hour of the day triple digit rally. That rally came after 3:00 pm on a Friday afternoon will heavy volume. So again, right on queue, we got a 232 point rally in the last hour of the day. Our government wants to control every facet of our lives. Excuse me. I need to go to the restroom right now and I fully believe Bernanke will be there to, uh..., well, help me out. Maybe he will feed me and clothe me. I'd hate to think that I have even one single responsibility anymore. I certainly don't need to watch my investments. Bernanke and the PPT are always there to save me! The chart shows the Dow with today's magic rally and also the magic rally of November 21, 2008. Now, look at February 12, 2009. 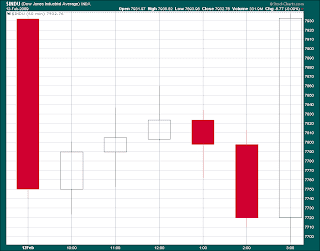 This is a one-day chart of the Dow with 5-minute bars. It is easy to see that at 3:00 pm, everything changed. Straight up we went with only two breaks in the uptrend. I assume these were the moments when the PPT had to reload the ink jets. We must also note that the PPT are late risers. They don't generally like to start their market manipulation until late in the afternoon. My guess is they also call their banker pals to let them in on the gag. There is no 'market' anymore. We are in an era of pure governmental manipulation. Another indication of PPT activity is the broad effect of their sudden buying binge. Sure the Dow recovered and that makes the bulls feel smart. So what. Everything on the planet went up as well. Here are a few other chart observations. So, when America is finally burnt to the ground, we know the identity of the true arsonists. Capitalism is a beautiful thing. It provides balance. It eventually punctures speculation and it rewards prudence, intelligence, and strategy. Since the surrender of our former government to the bankers, capitalism has been struck a death blow. The bankers don't want to let capitalism find the true value of their 'toxic assets'. It could be zero. They would rather sacrifice all of us than admit to their folly. Our elected officials are hard at work surrendering to these con men. They are desecrating our Constitution. Let their names be etched on the 'stimulus debt shovel' that buries us for eternity. Let the charts show their actions like the droppings of vermin.